Since 2008, the annual Sea Ice Outlook (SIO) has provided an open process for those interested in arctic sea ice to share ideas about the September minimum sea ice extent. This year (2014) represents a transition for the SIO, as it is now managed as part of the Sea Ice Prediction Network. The July Outlook report was developed by Walt Meier, NASA Goddard Space Flight Center, and the rest of the SIPN leadership team, with a section analyzing the model contributions by François Massonnet, Université Catholique de Louvain. 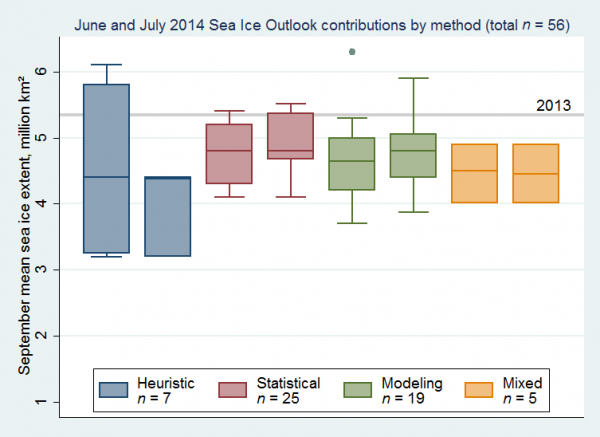 The median Outlook value for September 2014 sea ice extent is 4.8 million square kilometers with quartiles of 4.4 and 5.0 million square kilometers. Thus, the median value is slightly higher than the June value (4.7) and the distribution of Outlooks is slightly reduced relative to June. The overall range is now from 3.2 to 5.9 million square kilometers. These values compare to observed values of 4.3 million square kilometers in 2007, 4.6 million square kilometers in 2011, 3.6 million square kilometers in 2012, and 5.4 million square kilometers in 2013. Sea ice declined at a pace more rapid than normal during June, particularly late in the month when extent decreased by over 100,000 square kilometers per day. The decline has since slowed somewhat. The Sea Ice Outlook is a venue for discussion and networking and provides a transparent exercise in both scientific sea ice predictions as well as estimates from the public. The post-season activities will provide more of a scientific analysis of the methodologies, relative performance, etc. This month's full report includes the comments on modeling outlooks and on regional predictions, a summary of current conditions, key statements from each Outlook, and links to view or download the full outlook contributions.